A family ski vacation can be an annual highlight. 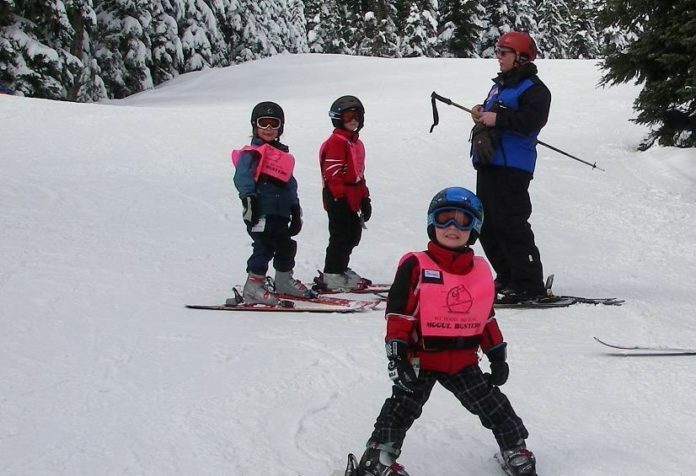 Children need to be well prepared and equipped with functional gear and comfortable warm ski clothing. Skiing en famille is not an easy undertaking, especially with small children who are beginning skiers. 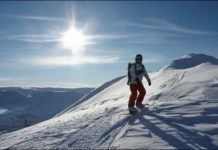 The learning curve for skiing is sometimes as steep as a black diamond slope, requiring time, comfortable functional cold-weather clothing, good gear, and, perhaps most of all, a good attitude. 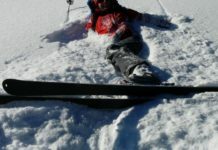 There are a few things parents can do before the first ski vacation to make an introduction to skiing easier on everyone. Many ski areas have hiking and biking trails and other activities during the summer months. 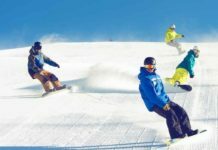 Families who live near a ski area, or near enough to visit one on a holiday weekend, can familiarize their children with what a ski area looks like. Many ski areas have lifts running on weekends for mountain biking or, in autumn, for leaf-peeping. Riding the lifts is a great opportunity to familiarize children with ski lifts, long before it is time to actually ride them with skis on. Familiarity takes a lot of fear out of the equation. Showing picture or videos of families skiing is another good pre-ski-trip introduction to the activity. The pictures let kids know what to expect. Children’s ski clothing is a conundrum because it rarely fits for more than a couple of seasons. Yet children need the same comfort and warmth that adults do, so inexpensive clothing is not necessarily the best deal. Some clothing layers can be taken from the child’s winter play wardrobe, especially wool sweaters, fleece jackets, hats, and socks. Just make sure that there is no cotton content, because cotton absorbs water and doesn’t wick, which can contribute to hypothermia. Long underwear should be made of polypropylene, Capilene, or some other wicking, nonabsorbent fabric. 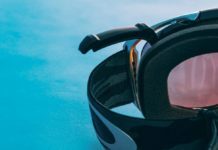 It’s not a bad idea to keep specialty ski equipment separated from everyday outdoor play clothes, if for no other reason than it can be found when needed. Ski gloves are generally much warmer and stiffer than everyday winter gloves. Don’t use everyday scarves for skiing: The ends can get caught in ski lift machinery. Instead, a balaclava or a neck tube are better choices for skiers. Trading hand-me-downs with friends who have children of different ages. Going to garage sales and yard sales in communities with ski areas. These are generally held in the summertime, so it takes a bit of planning, but outgrown ski clothing is a staple at these sales. 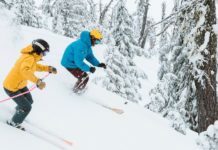 End of season sales are another good time to shop, as long as parents remember that their children will probably grow a size between the March end-of-season sale and the start of ski season next December. Most ski areas have shops, and stores in nearby towns will also have ski equipment. 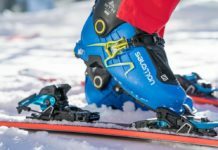 Children’s skis and bindings, at least for beginners, are much cheaper than adult gear, but a family can still rack up quite a tab, especially since children outgrow ski boots every two. years. 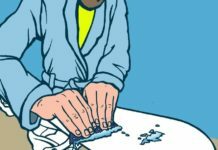 Skis might last for three years, but bindings have to be adjusted with changes of boots and as the skiers skill level improves. Parents have two choices: renting or buying. Gear rentals are always available at ski areas, and ski packages often include rentals, a ski lift ticket, and even ski lessons. Renting offers a huge advantage for families traveling by air by eliminating extra baggage charges, not to mention the hassle of traveling with a family’s skis and poles. Renting ski equipment by the day makes sense for families who ski only once or twice a year. But if skiing often and close to home, families might consider renting children’s gear for an entire ski season to avoid having to go through the rental line at the beginning of each ski weekend. Annual rentals are sometimes available at outfitting shops. However, annual rentals can sometimes cost nearly as much as buying gear on sale.. Families with more than one child often find that it is economical to buy gear and pass it down from one child to the next. As with clothing, a gear swap with other ski families can also yield benefits for everyone. Skis can also be found at yard sales, although the age and quality vary greatly. 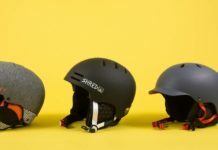 Parents who have the experience to judge gear can find some good deals on used ski gear this way. Gear needs to be checked and maintained every year. With the right combination of preparation and comfortable warm clothing, a family ski holiday can be an annual highlight. A family ski vacation is both a great getaway, and a source of memories and tall tales for years to come.